How Trump’s policy agenda is conventional and reversible. Photo illustration by Slate. Photos by Drew Angerer/Getty Images, Win McNamee/Getty Images, and Chip Somodevilla/Getty Images. The president’s first-year accomplishments are more typical and fragile than the commotion made it seem. Slate is running a weeklong series on President Trump’s first year in office. Read Jamelle Bouie’s companion essay about the only promise Trump has kept from his inaugural address. After eight years of a Democratic administration, the new Republican president came in with a lightning-strike agenda. He confirmed reliable, career conservatives to the Cabinet and stocked the federal judiciary with young, right-leaning judges. He put a reliable originalist on the Supreme Court, then picked off some low-hanging policy fruit, repealing or mitigating dozens of Obama-era regulations that he said were burdening business. He made repealing and replacing the Affordable Care Act and tax reform his two legislative priorities, pushing Congress to strong-arm them through the process. (The first push collapsed in its unpopularity; the second was successful.) Together, the Republican leadership repealed the individual mandate, opened the Alaska National Wildlife Refuge to oil drilling, and paid for a massive tax cut by punishing coastal Democratic enclaves. The new commander in chief declared a new day in foreign policy, which consisted mostly of performative saber-rattling—we don’t apologize for America anymore, and so on—without actually changing much. And President Jeb Bush is just getting started. For all President Trump’s outlandish rhetoric, his first-year record is about what you would expect from any generic Republican with an adult-level vocabulary, a modicum of political experience, and a registrable level of humanity. His accomplishments thus far are almost entirely in keeping with the positions espoused by Jeb and every other Republican Trump defeated in 2016. Most of Trump’s more, um, ambitious ideas—like a ban on Muslims and revisiting libel laws—have been curbed by the courts or were hallucinations from the start. Others, like the tax cut, are likely to be revisited if and when Democrats reclaim power, an outcome that appears to be hastened by Trump’s inability to control himself and by the innate unpopularity of the GOP agenda. Which is not to suggest there is no difference between a Trump presidency and that of a generic Republican. A more conventional Republican would not be embroiled in controversies over “shithole” countries or support for neo-Nazis. He or she might not have made such a public show of dismissing Obama’s executive actions—whether on DACA, the Iran nuclear deal, or the Paris climate agreement—and instead might have less bombastically adjusted these policies to align with the party’s ideology. A generic Republican would also be far more comforting to have as a head of state, presumably operating with the understanding that we don’t construct nuclear weapons for the purpose of using them. Trump is a pressure cooker. Until he pops, though, the policy reality is not radically different from traditional Republican orthodoxy. We have conventional Republican governance because, in lieu of a president who knows what he’s doing, the conventional Republicans around him are setting policy. Trump may have won as an “outsider,” but when it came time to govern, his outsider-ism required him to delegate all of the work to insiders. If you asked science to create a conventional Republican insider in a test tube, it would present to you Senate Majority Leader Mitch McConnell. House Speaker Paul Ryan fell under some hypnotic spell as a young man that left him laser-focused on eradicating the Great Society. Appointees, both executive and judicial, are hand-plucked from the rosters put together by the Heritage Foundation and Federalist Society. A generic Republican president would have picked from the same crop because he knew them. Trump picked them because he doesn’t know anyone, and the conventional Republicans who manage his presidency put the names in front of him. 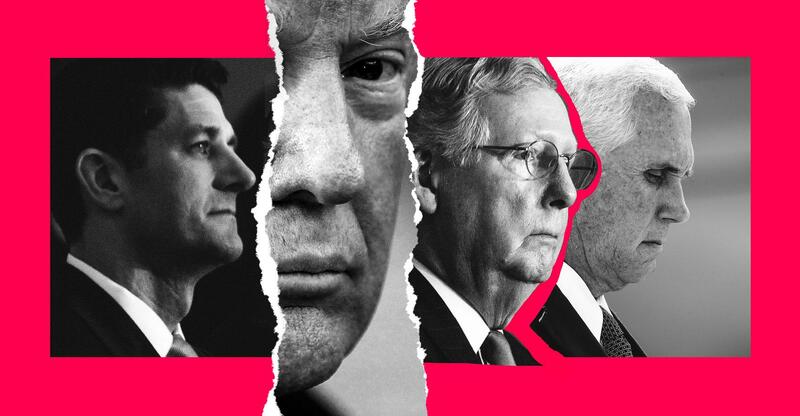 These Republican leaders decide the agenda, working from a simple formula: Do whatever can attain 217 Republican votes in the House and 50 in the Senate. It’s always adorable when presidential candidates, during the primaries, ferociously debate the particulars of their tax plans or health care bills, as though they won’t be determined by a few tenured members of the Senate Finance Committee. The tax bill that Donald Trump signed last month—the one he now touts as his signature achievement—was the same tax bill that Jeb Bush would have signed: the one that could get the votes of both Kentucky Sen. Rand Paul and Maine Sen. Susan Collins. The lightning strike is over now. Heading into Year 2, Trump and congressional Republicans’ political capital for major partisan legislation, none of which is popular, is exhausted. Though House Republicans have flirted with entitlement reform in 2018, the appetite for hugging this third rail is minimal in the Senate. A bipartisan infrastructure package could be considered, but it’s likely to get bogged down in election-year politics. And then that’s that. By this time next year, Republican margins in the House will at least be sharply cut. If Democrats can take control of the House, the Republican agenda will be thwarted entirely, and the Trump administration will be reduced to scouring for additional regulations to axe or crafting new executive orders to trumpet as signs of success. If Democrats can follow that up by unifying control of the government in 2020, that agenda will begin to be reversed. Trump’s record over the past year is more or less the same record that any winner of that 17-person primary field would have produced, and just as fragile. The problem with a lightning-strike partisan agenda that doesn’t even bother soliciting buy-in from the opposite side is that it only lasts until the other side gets its turn to weigh in. The Trump administration can poke holes in the Affordable Care Act through the regulatory process, and then the next Democratic administration can unpoke them. On tax reform, even if Democrats are loath to raise individual tax rates as part of some future course correction, they could raise the rates on corporations and high-earners and redistribute the gains toward programs they favor. Republicans, who generally respond with alarmist cries about the national debt, provided future Democratic majorities with trillions of dollars in pay-fors to apply how they see fit. The Trump presidency has had a more profound effect on the zeitgeist. It has hastened the country’s turn toward psychiatric breakdown. The rest of the world hasn’t been able to turn its eyes away from our national embarrassment, as Trump routinely alienates allies and provokes fears of a nuclear war with North Korea. But the rest of the world has been appalled by past presidents too—for far more grave reasons than our leader’s Twitter behavior. Trump has yet to embark anything nearly as dramatic as George W. Bush’s decision to launch the Iraq war, which killed hundreds of thousands of people, destabilized the region, and shredded America’s image around the world. So far, Trump has opted not to scuttle the Iran nuclear deal, and his most consequential foreign policy decision—moving the U.S. Embassy to Jerusalem—will take years to accomplish and could still be reversed by a future administration. The lack of permanent accomplishments does not mean that Trump has been better than a generic Republican capable of minding P’s and Q’s. He isn’t. As my colleague Jamelle Bouie explains, Trump’s victory has emboldened racists and white nationalists to come out of the shadows. But Trump’s paper record over the past year is more or less the same record that any winner of that 17-person primary field would have produced, and just as fragile. To argue that his first year has been apocalyptic would be to argue that the Republican agenda itself is apocalyptic. Those arguments are available. One of them is straightforward enough for a 5-year-old to understand: Climate change is rapidly destroying the world, and the GOP ignores this, denies it, and hastens the pace with which it’s happening. The world may well explode in the next year. And yet look at what the first year of Donald Trump has produced for all of its wild mood swings: conservative judges, hydrocarbons, and tax cuts for the rich. It’s the same old story, with more commotion.